No matter where you are in the Cotswolds villages, there’s a distinct feeling time has stood still, with the landscape remaining unchanged for hundreds of years. 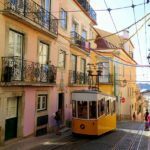 The villages, with their honey-colored cottages, shops, and churches were made from a kind of limestone quarried in the area beginning in the Middle Ages and this distinctive charm has been preserved. During the Middle Ages, the Cotswolds towns and villages were also famous for their wool production. 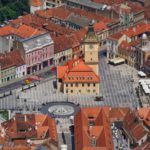 The herds of sheep still grazing in the rolling pastures are reminiscent of this past, as are the market squares in the central towns. Today the lucky travelers who visit can easily see why the Cotswolds have been recognized as an area of Outstanding Beauty. 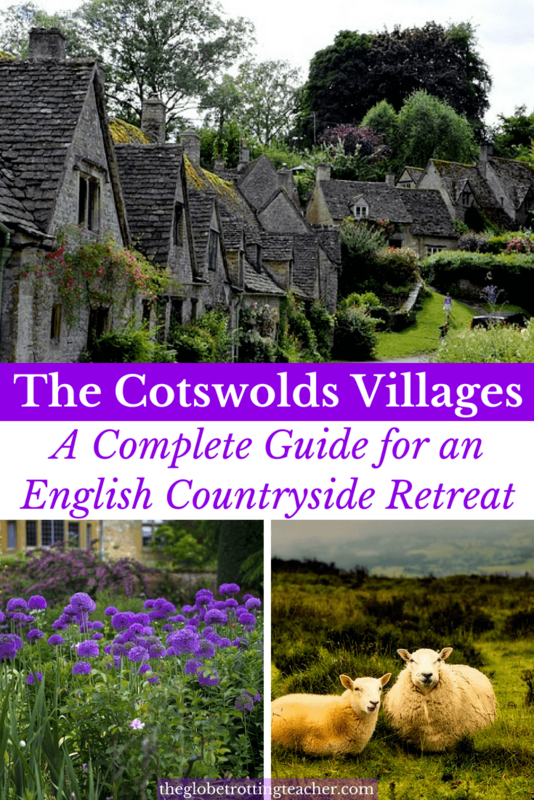 Use this guide to do your Cotswolds planning discovering things to do in the Cotswolds, how to get here from London, Cotswolds places to stay and eat, and of course, the best Cotswolds villages to visit. The Cotswolds villages are the perfect complement to spending time in London. 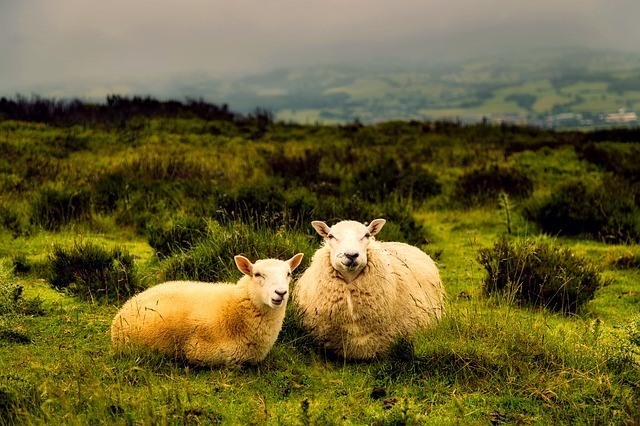 Swap the city vibe for the English countryside, dotted with grazing sheep and quaint villages for a quintessential UK retreat. The Cotswolds are a cluster of tiny villages nestled in the countryside about 2 hours by car northwest of London. To orient yourself, use the map below. From the map of Cotswolds villages, you can see how close they are to one another, as well as other popular places to visit. Oxford is an hour to the east. Bath is about an hour and a half to the south. 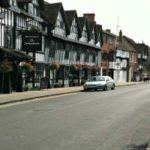 And, Stratford-upon-Avon is just a half hour to the north. I think one of the reasons why I so love spending time in the Cotswolds is I am reminded of one of my favorite books, Pillars of the Earth by Ken Follett. I can imagine what the wool markets must have been like when I see the sheep grazing, the market squares, and the churches built from money made on busy wool market days. In addition to the well-built and maintained limestone houses, Chipping Campden has a historic Merchant Hall that was used to sell cheese, butter, and poultry and a pretty Church of St. James with grounds that overlook the rolling green hills just beyond the town. 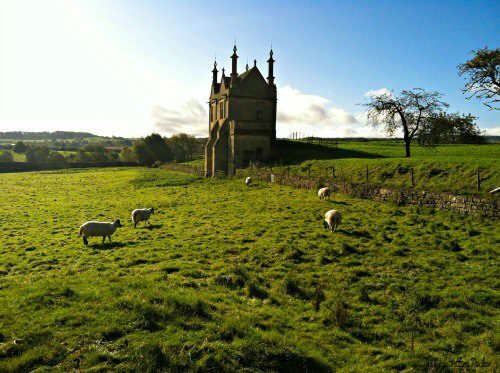 Chipping Campden was known for the high quality of its wool in the 14th, 15th, and 16th centuries and still, today sheep graze in the pastures just behind the church. Stow-on-the-Wold is a market town situated in the heart of the Cotswolds. The location made it ideal for farmers and wool merchants to come together for some of the area’s largest fairs where sheep were bought and sold. The large market square speaks to this past. Today, Stow is one of the best places in the Cotswolds for its cafes, boutiques, art galleries, and antique shops. It’s also between 10-30 minutes from many other Cotswolds villages. Be sure to visit the medieval St. Edward’s Church in Stow. 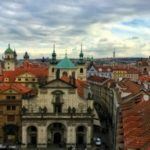 It largely dates back to the 13th-Century and is a true architectural gem with stained glass windows. Lord of the Rings fans will wonder if J.R.R. Tolkien was inspired by the door on the church’s north side flanked by 2 very Middle Earth looking trees! Bourton-on-the-Water is rightly named because of its pretty Venice-like canals that run through the town. The trees arching over the river, along with walkable stone bridges and shop-lined streets make this Cotswolds village a big draw for visitors. If you can visit before noon or wait until after 4:30-5:00 p.m. when the Cotswold day tour buses leave. Lower and Upper Slaughter are quintessential Cotswolds. Picture-perfect, tranquil, and complete with Cotswolds’ kissing gates in the meadows and fields connecting both villages. A weekend in the Cotswolds isn’t complete without spending time in the Slaughters. 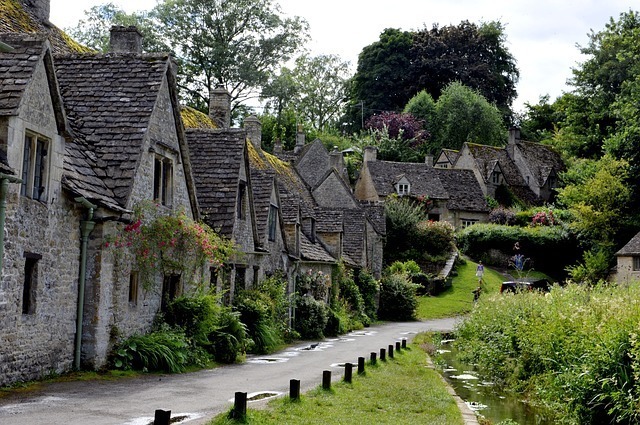 Bibury’s weaver cottages along Arlington Row were built in the 1300s and have been named a national architectural conservation area. It’s one of the most photographed streets in the Cotswolds and considered one of the prettiest villages in England, too. Burford’s High Street is the main draw with its antique shops and cafes. The church and the town’s historic buildings like Tolsey Building are also worth seeing. If you’re driving to the Cotswolds from Oxford, Burford is just 18 miles further to the west. Snowshill overlooks the Cotswolds countryside and villages like Broadway. It’s a tucked away spot offering tranquility and great views. Snowshill Manor and Garden belongs to the National Trust and can be visited. Grab a beer and a bite at the Snowshill Arms. 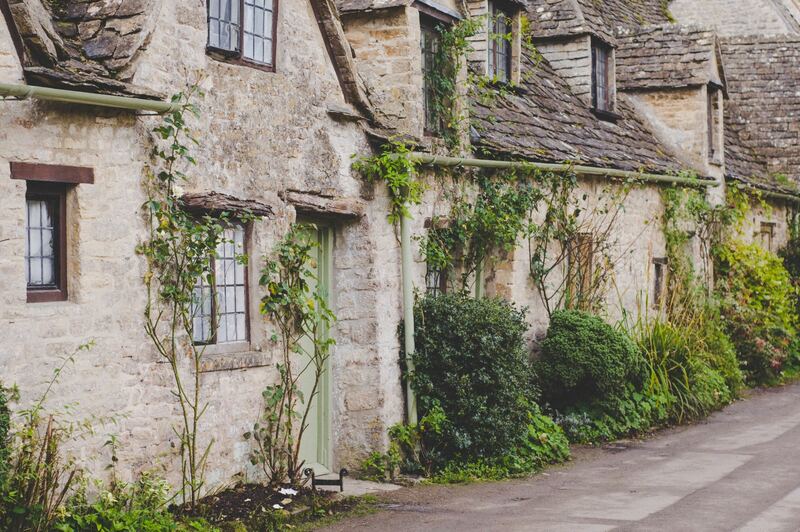 The dreamy little village of Stanton is classic Cotswolds. It has quiet lanes to walk around with the signature limestone cottages. 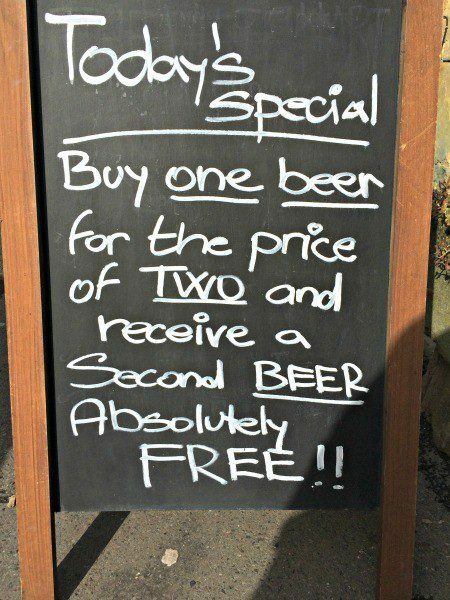 There are no shops or businesses, except for a single pub. It’s not far from Chipping Campden and Stow-on-the-Wold and can be part of a walking loop from Broadway. The sleepy, scenic Cotswolds lend themselves to this type of long ago imagining. Time spent in the Cotswolds is for clearing your mind and taking it slow. 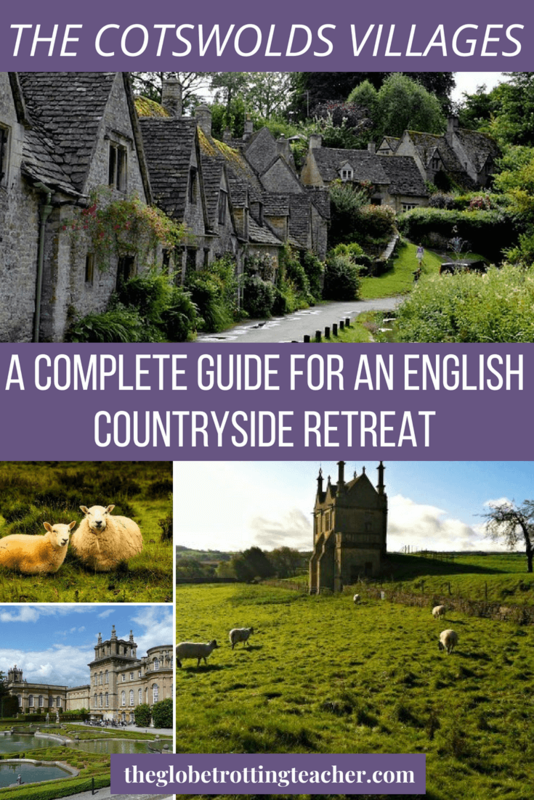 Part of what to do in the Cotswolds is to just enjoy wherever you are. The area is as pretty as a picture. You’ll want to spend as much time outdoors taking in the landscape. Cotswolds walks like the Cotswolds Way, a 100-mile walk through the countryside and villages, is a popular multi-day activity. 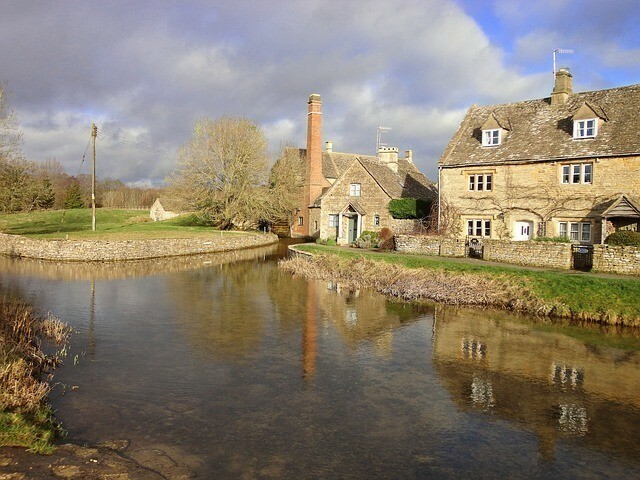 Parts of the Cotswolds Way, as well as shorter walking trails in and around the villages, are perfect for day outings. Others choose to cycle or horseback ride to immerse themselves in the pastoral surroundings. I love the picturesque Slaughters and, for example, there’s a 1-mile walking path from Lower to Upper Slaughter, which goes through the village and past the Old Mill and its shop and cafe inside. If you loop back, you can even continue along Warden’s Way to Bourton-on-the-Water for a longer full day walk. Shopping (even window-shopping) makes for a great day in the Cotswolds. 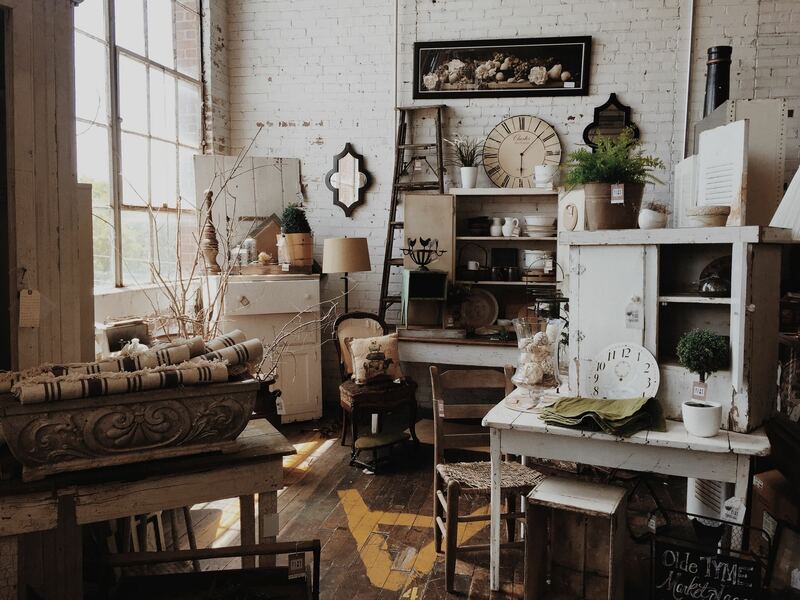 The villages have their own one-of-a-kind boutiques, antique shops, art galleries, and more. Chipping Campden, Burford, Stow-on-the-Wold, Bourton-on-the-Water, Cirencester, and Moreton-in-Marsh were my favorites to stroll through and shop. What’s more, many of the shops in the Cotswolds villages are centered around the village square which have been the village marketplace for hundreds of years! 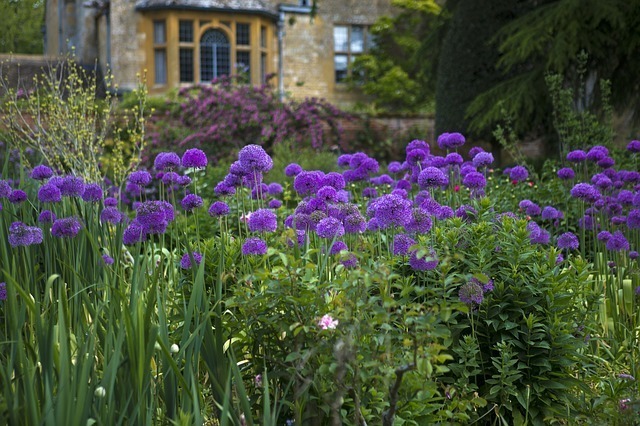 Not far from the Cotswolds villages of Chipping Campden and Snowshill, you can visit Hidcote Manor Garden. It’s a British arts and crafts style garden that feels like it has different “rooms.” Each room has its own unique design and feel. If you visit the Cotswolds in June or July, stop at the Cotswold Lavender farm for a chance to see the fields in full bloom. 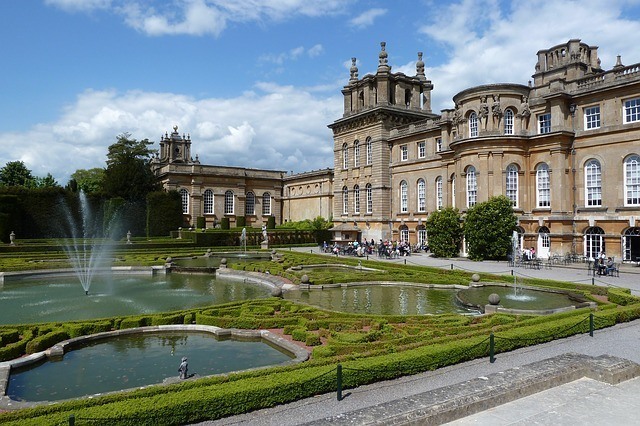 Besides the thatched-roof houses, churches, and shops in the villages, architecture and history buffs will love visiting Blenheim Palace, Sudeley Castle, and Chavenage House. Blenheim Palace is a UNESCO World Heritage Site built in the 1700s and the place where Winston Churchill was born. Visitors can tour the elegant State Rooms and manicured gardens on the grounds. The Palace is just 20 minutes along country roads from the Cotswold village of Chipping Norton. Located near Winchcombe and dating back to the 15th Century, Sudeley Castle is privately owned and has historical artifacts belonging to past Kings and Queens. 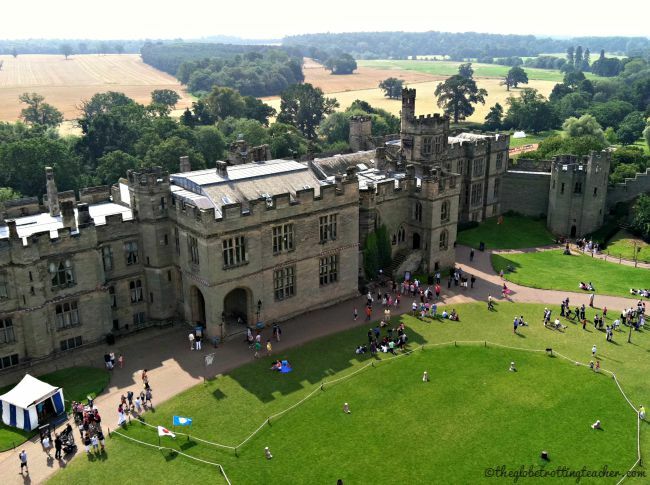 The Castle has 9 gardens, most famously the Queens Garden which was beloved by several past Queens of England. The chapel on the castle grounds is also the final resting place of Katherine Parr, the last wife of Henry VIII. Chavenage House is an Elizabethan Manor House owned and shown by members of the family who own the house. It was built in the late 1500s from the Cotswold stone and is less than 2 miles from the Cotswold town of Tetbury. Lastly, and because I’m a huge Downton Abbey fan, Cotswolds visitors should know the town of Bampton is just a half hour from Stow-on-the-Wold and is the place where many of the show’s village scenes were filmed. Highclere Castle (a.k.a. Downton Abbey) is just an hour’s drive. 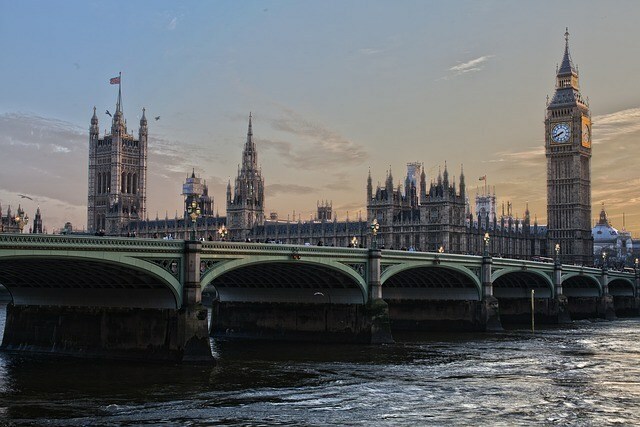 Most travelers will start their England trip in London and then move on from there. 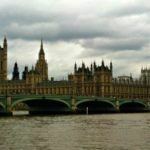 The best ways to get to the Cotswolds and explore the area are to rent a car or to plan a Cotswolds tour from London. It is possible to get the Cotswolds without a car. From London to the Cotswolds by train, you’d depart from Paddington Station and get off in Moreton-on-Marsh with a likely connection through Oxford. But, from there, it would still be tricky to get around. The Cotswolds have few public transportation options, with limited-schedule buses being the best and only way to get from village to village. With a rental car, you’ll have the freedom to move around as you wish. Just know, if you’re visiting in the warmer, peak-season months, there’s likely to be some traffic along A44 and A429. A Cotswolds day trip is best planned during the week. Even a weekend break to the Cotswolds might be better off moved to a couple of days during the week instead. If you’re short on time or are just planning a Cotswolds day trip from London, be careful with tours that offer too many places to see in a single day. 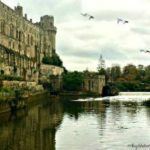 A full day tour promising some combination of Oxford, the Cotswolds, Warwick Castle, and Stratford-upon-Avon likely means shorter stops in each place and seeing many of the Cotswolds villages from a bus window. 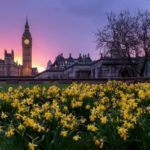 If you’re truly wanting to experience the Cotswolds and have 1 day, consider a Cotswolds from London tour that focuses on just the best places to visit in the Cotswolds. I know it’s tempting to squeeze more places in, but even after 2 trips to the Cotswolds, there are still reasons to return! I stayed in Chipping Campden at the beautiful Charingworth Manor. This manor house is over 700 years old. It sits high atop a grassy hill, offering picturesque views of the countryside. I’ve also looked at and wanted to book the Slaughters Manor House on one of my Cotswolds trips. But, it was a bit last minute and I couldn’t find the availability I needed. Many of the Cotswolds hotels range from small inns and B&Bs. 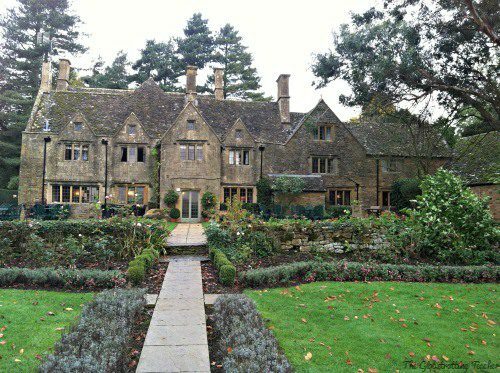 The surrounding countryside is so charming, even if you’re someone who typically stays in a larger, branded hotel, the best hotels in the Cotswolds are the luxurious manor houses and small B&Bs to match the ambiance of the area. Check current prices in the Cotswolds or book now. If you’re having trouble finding the best places to stay in the Cotswolds because it’s a last minute booking or during the high season, a larger town like Stratford-upon-Avon might be the solution. It’s just half an hour from the Cotswolds and is a great base for exploring the area, not to mention offers its own history and sights. There are plenty of places to eat in the Cotswolds, from picking up sandwiches for a picnic to having dinner at a fireside pub. I recommend lunch or just a midday snack at Lucy’s Tearoom in Stow-on-the-Wold. The sandwiches and cakes were delicious. The jars of strawberry jam we purchased were out of this world and caused several quasi-silverware sword-fights back home. Be sure to have dinner at Eight Bells in Chipping Campden. The atmosphere was warm and cozy, the food hearty and delicious. There was even a see-thru panel on the ground showing tunnels Priests had used when they needed to escape the nearby church! Where would you like to visit in the Cotswolds? Like this post? 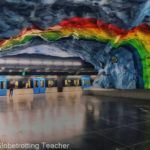 Please share on social media using the share buttons below! 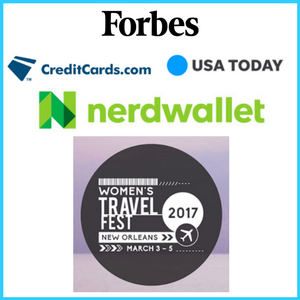 Pin this post to plan your trip!